The following article was written and published on the StrokeNet Newsletter web site by David Wasielewski. Retreat & Refresh Stroke Camp is not affiliated with StrokeNet, but they have many interesting and useful articles that I like to share with our readers, with permission from the StrokeNet staff, of course. As we all know strokes can happen at any age. Young and middle age adults who survive stroke often have families with young children who need to deal with the challenges that a stroke brings to the family life. This begins with the initial trauma and crisis associated with the event and continues with the challenges of changing home life and relationships that become part of the stroke survivor’s life. Explaining what is happening to a child presents a particular challenge. Sudden changes in routine, trips to the hospital and conversations with strange doctors about illness and strokes are frightening for a child. The child’s sensitivities and ability to understand what has happened and what might happen in the crisis need to be carefully dealt with. It is probably a time where a skilled professional should be consulted but is also a time when those folks are not usually sought out. The unprepared adults are often left to their own devices to deal with the situation as best as they can. How does an adult family member reframe a stroke in ways that the child might understand? How do we help a child cope with the crisis even when we adults are often unable to hold it together as the situation unfolds? This is not something we, as parents typically prepare for. The effects of stroke are emotional, social and economic and need to be addressed in terms a child can understand. One paper describes stroke as a family illness as all aspects of family life are affected by the short and long term changes it brings. A much as the family might try to shield a child from the trauma that child will eventually need to deal with the reality that stroke brings to the family routine, both near and long term. http://www.nursingcenter.com/lnc/static?pageid=1346847#sthash.4WeqNiIZ.dpuf This article points to some of the many resources available to stroke survivors with young children. Recognizing this need, the national stroke foundation (NSF) has provided some guidance to families in the midst of this crisis: http://www.strokefoundation.com.au/blog/?p=983 At the NSF social media sites, the StrokeConnect online forum and StrokeLine have all attracted questions about how best to explain stroke, and its aftermath, to children. The UK stroke association provides a Guide for explaining stroke to a 9 year old. It breaks the details into words and concepts the child can understand. Several children’s books are available that help explain strokes to young family members. Some are immediately available on YouTube or in pdf format for free. Mama Just Shake It is another children’s book on stroke with the text available on YouTube . It explains how a child views issues like hemiplegia and aphasia. Grandpa’s Crooked Smile is available on line. It illustrates how a child deals with his Grandpa’s stroke and incorporates a number of learning exercises to help a child to recognize stroke symptoms. Link to book. These books might not cover all aspects of a stroke but provide a context or a starting point for a more meaningful conversation with a child about the various aspects of dealing with changes in stroke survivors. They also illustrate the level of understanding that a child is capable of. Families with young children might consider speaking with a professional psychologist about the effects a stroke have on children and the family dynamic. Psychologists are often readily available at the hospital, especially in rehab units. It is important to consider the child’s unique situation and needs even as the adults in the family struggle themselves to adjust to the changes that strokes bring to their lives. The following was taken from a status update that showed up on my personal Face Book page. I thought this was very appropriate advice to pass along to the readers of this blog. 1. It’s better to find out than miss out. Be aware of the medications that have been prescribed to your loved one and their side effects. Ask if your home should be modified to meet the specific needs of the stroke survivor. Ask a doctor, nurse or therapist to clarify any unanswered questions or to provide written information that explains what occurs after the stroke and during recovery or rehabilitation. 2. Reduce risks, or stroke may strike again. Survivors who have had one stroke are at high risk of having another one if the treatment recommendations are not followed. Make sure your loved one eats a healthy diet, exercises (taking walks is great exercise), takes medications as prescribed, and has regular visits with their physician to help prevent a second stroke. 3. Many factors influence recovery. Recovery depends on many different factors: where in the brain the stroke occurred, how much of the brain was affected, the patient’s motivation, caregiver support, the quantity and quality of rehabilitation, and how healthy the survivor was before the stroke. Because every stroke and stroke survivor is unique, avoid comparisons. 4. Gains can happen quickly or over time. The most rapid recovery usually occurs during the first three to four months after a stroke, but some stroke survivors continue to recover well into the first and second year post-stroke. Editor's note: I will take exception to the last part of this item #4. Retreat & Refresh Stroke Camp's experience with over 130 camps spanning 11 years and the several thousand survivors we have come in contact with during that time has shown that while the most rapid recovery does occur during the first three to four months we see continued improvement for many years and even over a lifetime. Stroke survivors should never give up, never quit striving to improve. Soon I will be posting an article that addresses this very topic. 5. Some signs point to physical therapy. Caregivers should consider seeking assistance from a physical or occupational therapist if their loved one has any of these complaints: dizziness; imbalance that results in falls, difficulty walking or moving around in daily life; inability to walk six minutes without stopping to rest; inability to do things that he/she enjoys like recreational activities or outings with family or increased need for help to engage in daily activities. 6. Don’t ignore falls. Falls after stroke are common. If a fall is serious and results in severe pain, bruising or bleeding, go the Emergency Department for treatment. If a loved one experiences minor falls (with no injury) that occur more than two times within six months, see your physician or the physical therapist for treatment. 7. Measuring progress matters. How much acute rehabilitation therapy your loved one receives depends partly on his/her rate of improvement. Stroke survivors on an acute rehabilitation unit are expected to make measurable functional gains every week as measured by the Functional Independence Measure Score (FIMS). Functional improvements include activities of daily living skills, mobility skills and communication skills. The typical rehabilitation expectation is improving 1 to 2 FIM points per day. 8. A change in abilities can trigger a change in services. Medicare coverage for rehabilitation therapies may be available if your loved one’s physical function has changed. It there appears to be improvement or a decline in motor skills, speech or self-care since the last time the patient was in therapy, he/she may be eligible for more services. 9. Monitor changes in attitude and behavior. Evaluate whether your loved one is showing signs of emotional lability (when a person has difficulty controlling their emotions). Consult a physician to develop a plan of action. 10. Stop depression before it hinders recovery. Post-stroke depression is common, with as many as 30–50 percent of stroke survivors developing depression in the early or later phases post stroke. Post-stroke depression can significantly affect your loved one’s recovery and rehabilitation. Consult a physician to develop a plan of action. 11. Seek out support. Community resources, such as stroke survivor and caregiver support groups, are available for you and your loved one. Stay in touch with a case manager, social worker or discharge planner who can help you find resources in your community. 12. Learn the ins and outs of insurance coverage. Be sure to consult with your loved-one’s doctor, case manager or social worker to find how much and how long insurance will pay for rehabilitation services. Rehabilitation services can vary substantially from one case to another. Clarify what medical and rehabilitation services are available for hospital and outpatient care. Determine the length of coverage provided from your insurance (private or government supported) and what out-of-pocket expenses you can expect. 13. Know when to enlist help. If rehabilitation services are denied due to lack of “medical necessity,” ask your loved one’s physician to intervene on his or her behalf. Ask the physician to provide records to the insurance carrier and, if needed, follow up yourself by calling the insurance company. 14. Know your rights. You have rights to access your loved-one’s medical and rehabilitation records. You are entitled to copies of the medical records, including written notes and brain imaging films. 15. Take care of you. Take a break from caregiving by asking another family member, friend or neighbor to help while you take time for yourself. Keep balance in your life by eating right, exercising or walking daily, and getting adequate rest. I got this tip from Clay Nichols, Co-founder of MoreSpeech and Bungalow Software which both provide Speech & Language Software that is used for speech recovery after a stroke. The following is a re-post from the Ted Talk web site: www.ted.com. I must warn you before you click on the link at the bottom of this page the video of Jill Bolte Taylor's talk shows her handling an actual human brain. However, I think you will be captivated by her personal experience. 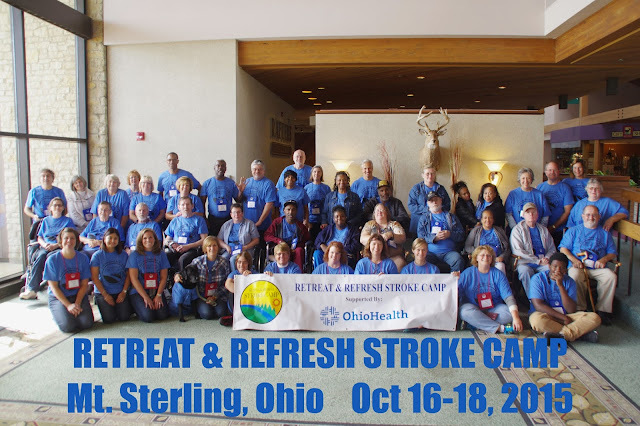 Ohio Stroke Camp 2015 - Sleeping In Tents? No! Eating Hot Dogs? NO!!! Blogger Note: due to circumstances this post is running for two weeks. A new article will be posted by November 15th. Do you think you know what Retreat & Refresh Stroke Camp is all about? Guess again! Let me show you our Ohio camp as an example. And we had over fifty-five campers. Okay, this last one might have been the result of a camper eagerly anticipating approaching Halloween. (Yeah, kinda creeped me out, too). And this is only a few hours of what we do at a full weekend of camp.